For about a year or so, quite a few of my close friends have told me I should write a dating blog, or something along those lines. I find this to be borderline hysterical, as I have not even been in a relationship since season four of The Wire began. I suppose I have had some interesting adventures in the love and/or dating sphere since then, but absolutely nothing has stuck. Well, except Besito Ysidro, of course. And food. For the past two or three winters I have been having a lot of fun playing with sunchokes. Prior to that they were relatively unknown to me. They are really very interesting, however, and their unusual texture and flavor make for fun and experimental dishes – but for me, mostly soups, purees, mashes and hashes. This winter I have been all about celery root, or celeriac. I have had all sorts of celery root things before, but I don’t think I ever stopped to consider that celery root was any different than celery. Who knows why that would be. And, in case you didn't know, celery and celery root are not the same thing. It is a kind of celery, grown as a root vegetable for its large and bulbous hypocotyl rather than its stem and leaves. At the end of January I had a lovely celery root soup at The Mercantile. This inspired me. 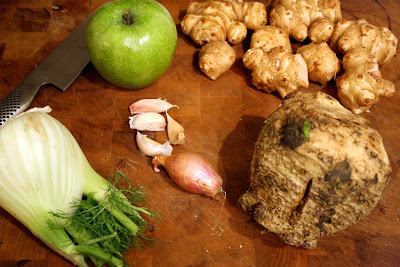 The sunchoke and celery root appeal to me in similar ways, ways not unlike the artichoke. I mean, who ever looked at any of these items and thought, “I wonder if I should try to eat this gross, and imposing vegetation?" These are ugly and unwelcoming looking shapes. But I'm glad someone did. Because they turned out to be so interesting – so complex, multi-layered, delicious, and fun to cook with. Actually, kind of like the men I am often attracted to. And dogs, for that matter. Mise en Place - Celery Root is on bottom right. This brings me to Eduardo. The latest man in my life. I met Eduardo about a week and a half ago. He was being fostered by an incredibly sweet, and humanitarian, couple in West Hollywood. Regardless of the fact that they own four cats, some feral and with health problems (and none that care for dogs), they still managed to save Eduardo from a certain death at a shelter on the very day he was to be put down. They asked me to take care of him for a few days while they went out of town and it was love at first snuggle. I adopted him. Well, to be clear, Maggie and I adopted him. Eduardo Facebook Saverin Shaffbar and his Twin. Not unlike the celery root or the sunchoke, or the men I often find myself attracted to, Eduardo is not without his unattractive qualities. He can be quite the surly little man at times. But ultimately, when he's not growling at you for trying to pick him up, or put him down, he is beautiful, complicated, multi-dimensional, snuggly, goofy and well, pretty damned sweet. He sort-of dares you to love him. And he has the funniest little teeth. They are more like tiny human teeth than doggie teeth. Like tiny, little pieces of rice. That being said, ironically, I have a date tonight. Not with a root vegetable or a dog. Or Maggie. But with a boy. Oof. Wish me luck. I will now leave you all with that recipe I know you've been waiting for - the soup I promised in the last post. 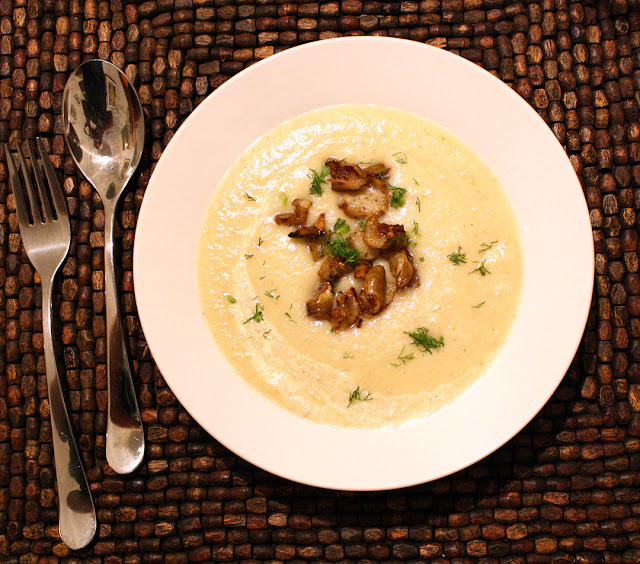 Celeriac Soup with Sunchoke "Croutons"
Combine first 7 ingredients in heavy large pot. Add enough water to cover. Sprinkle with salt. Bring to boil, reduce heat to medium, and simmer with lid slightly ajar until vegetables are tender, 15 to 20 minutes. Drain; return to pot. Discard thyme sprigs and bay leaf. Stir over medium heat to dry vegetables. Using immersion blender, blend vegetables until coarsely pureed. Add cream. Stir in 3 1/2 tablespoons butter. Season with salt and pepper. Can be made 1 day ahead. Preheat oven to 425°F. 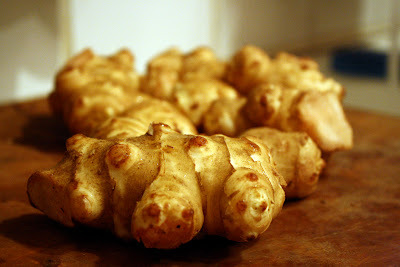 Cut sunchokes into 1/2-inch cubes. Place in medium bowl; add oil, sprinkle with salt and pepper, and toss to coat. Dot with remaining 1/2 tablespoon butter. Transfer to rimmed baking sheet; roast until tender and golden brown, turning occasionally, about 25 minutes. 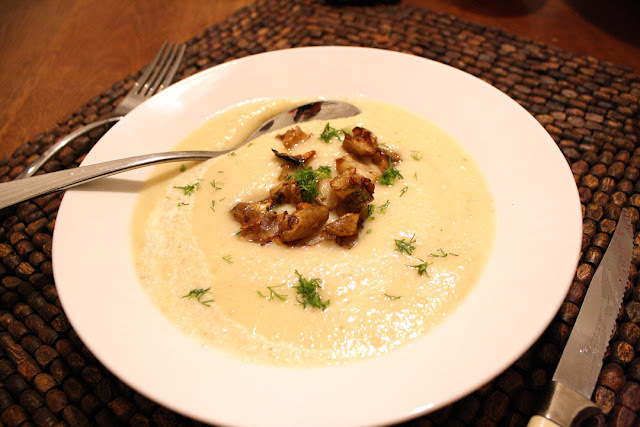 Place celery root and potato puree in serving bowl. Sprinkle sunchokes and chopped fennel over and serve. I was surprised, but the date was really good. I'm sure you'll hear about whatever may happen next soon enough! i am so behind i only this year discovered the beauties of sunchokes! can't wait to make this fabulous looking soup! And Eduardo is so freakin adorable! But more importantly how did the date go? And the date wasn't so bad either!